A beautiful and sweet strawberry watercolour drip cake topped with meringues and fresh edible flowers. Preheat the oven to 150 degrees celsius (fan-forced). Grease 3 x 20 cm round cake tins and line with non-stick baking paper. Place the Stork Bake, vanilla, sugar, eggs, flour, baking powder, bicarbonate of soda and milk in the bowl of an electric mixer (fitted with the paddle attachment) or mix by hand. Beat until combined. Beat the mixture vigorously until smooth. Spoon mixture into the lined baking tin and bake for 1 hour 5 minutes or until a cake tester inserted in centre comes out clean. Allow the cakes to cool in their cake tins for 5 minutes then turn out onto a wire rack and cool completely. Trim the tops of each cake so they’re flat and level and set aside. For the buttercream, combine the egg whites and sugar in the bowl of a stand mixer. Set over a saucepan of gently simmering water and cook, whisking constantly, until the mixture is hot to the touch – it should no longer be gritty when rubbed between your fingers. Transfer to the stand mixer and whip until glossy, stiff peaks form, about 5-7 minutes. Add the Stork Bake a few pieces at a time and whip until the frosting is creamy and smooth. Add the vanilla and salt and whip for 30 seconds to combine. Take about 3/4 of the frosting out and set it aside. For the remaining frosting, fold in the pink gel food colouring until combined and set aside. To make the white chocolate drip, place the white chocolate in a bowl. Heat the cream until it just starts to boil (in the microwave or on the stove) and then pour it over the white chocolate and allow it to melt. Stir until smooth. Allow to cool to room temperature, or it is the consistency of pouring cream. To assemble, place one cake layer on a turntable and spread with a thin layer of raspberry jam then top with 1/3 of the vanilla frosting. Place the second cake layer on top and repeat the layer of jam and vanilla frosting. Finally top with the last layer and coat the entire cake in a thin layer of the vanilla frosting. Refrigerate the cake for 10 minutes to set the frosting then coat with a final layer of frosting. 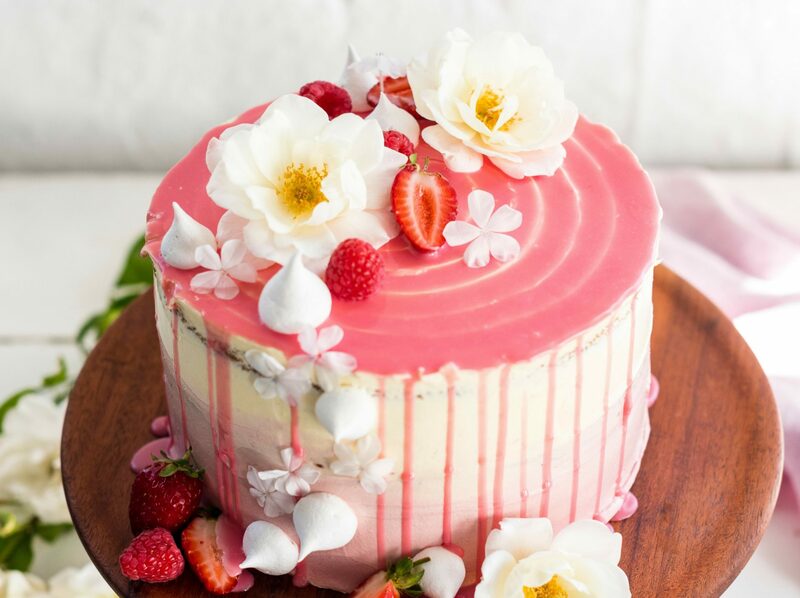 Smear a little of the pink frosting on the outside of the cake then run a palette knife around to give it a watercolour effect. Move the cake from the turntable to a cake stand for serving.